In a state known for its love of the good earth and clean waters, we thought it would be fun to come with a list of the natural wonders of Wisconsin. We could have made the list twice as long, but seven seemed like the perfect number. These “Mother Nature-made” wonders are the setting for some of the best outdoor recreation in the nation. 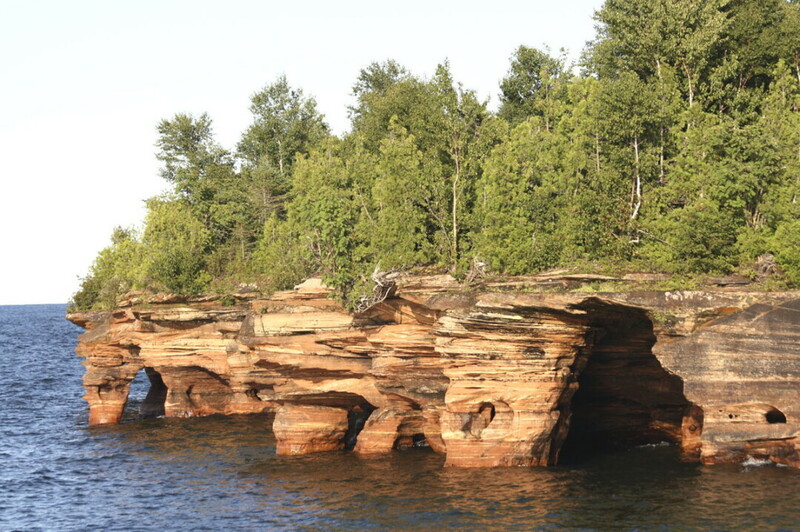 Calling to the explorer in all of us, this national park is a grouping or “archipelago” of 21 wilderness islands dotting the cold waters of Lake Superior and more than a dozen miles of shoreline with some of the most pristine remaining sandscapes in the Great Lakes region. There are old-growth forests, windswept beaches, and cliffs. There are sea caves to explore, carved out over thousands of years by the rhythmic waves. When the winter weather conditions are right, you can hike out to the caves to behold frozen waterfalls and chambers glistening with thousands of icicles. If winters get cold enough, Lake Superior freezes solid enough for visitors to hike or snowshoe out to the beautifully frozen ice caves. Often the backdrop for wedding couples to figuratively take the plunge, the 165-foot tall Big Manitou Falls in Pattison State Park near Superior is the fourth tallest waterfall east of the Rocky Mountains (impressive stats for sure). The water comes from the Black River, meandering 22 miles southwest of the park on the Wisconsin-Minnesota border. As it passes through Pattison, its first drop is actually 31 feet over Little Manitou Falls, then it reaches the awe-inspiring Big Manitou Falls. Let’s start with credentials. Cave of the Mounds in Blue Mounds is designated a “National Natural Landmark,” yet it may be easier to remember it as the “jewel box” of America’s major caves, named as such for the delicacy of its formations. The main cave began forming more than a million years ago as acidic water dissolved the limestone bedrock. The lower portion of the cave was formed by the rushing waters of an underground stream. Every drop of water entering the cave carries with it dissolved calcium carbonate, which leaves calcite crystals on the cave ceiling, walls, and floor. It can take upwards of 150 years to deposit one cubic inch of these crystal formations. Devil’s Lake State Park, not far from Wisconsin Dells, is the most visited state park in Wisconsin. Each year hundreds of thousands of visitors enjoy the 360-acre spring-fed lake, the 500-foot bluffs teetering over it, and the 30 miles of trails that comprise the trifecta of this natural wonder. Scientists believe the bluffs were formed 1.6 billion years ago, making them one of the most ancient rock outcrops in North America. Part of the Baraboo Range, this “ancient rock and roll” consists of hill ranges surrounding a canoe-shaped depression. If one Wisconsin lake is wonderful, then how would you describe 28 lakes, all interconnected no less? The Chain O’Lakes deep in the Northwoods of Wisconsin is the largest inland chain of lakes in the world. The depth of these lakes varies widely from one to the next, providing sufficient space for whatever floats your boat, be it water skiing, wakeboarding, pontoon cruising, canoeing, kayaking, or fishing. The Chain O’ Lakes crosses Vilas and Oneida counties, and a number of the lakes border the Nicolet National Forest on the east shoreline of the chain. The locals call it “The Ledge” – the limestone cliff that runs through High Cliff State Park, situated on the eastern shore of Lake Winnebago, Wisconsin’s largest lake. Mind you, this is no ordinary limestone cliff. It’s the Niagara Escarpment, a 440-million year old cliff that begins in Wisconsin and extends 1,000 miles to Niagara Falls. In fact, without the Escarpment there would be no Niagara Falls. In Wisconsin, this major land feature is rich with fossils, old native forestland, rare plant species, caves, waterfalls, bat hibernacula, and is a migratory stop for birds in the spring and fall. Horicon Marsh has the largest freshwater cattail marsh in the nation. It’s located in southeast Wisconsin and is best known as a migratory stop for vast flocks of Canada geese. But it’s more than just geese. It’s home to more than 290 species of birds, including the largest nesting population of redhead ducks east of the Mississippi. It is here that you’ll also find the largest nesting rookery in Wisconsin for the great blue heron. The majority of the marsh is a wetland ecosystem, a shallow, peat-filled lakebed scoured out of limestone by a massive glacier. But there are also upland habitats like prairie and woods, providing the needed diversity to support the many types of wildlife through the seasons. To learn more about the wonders Wisconsin offers, visit travelwisconsin.com.